But the Head of the Liu Family, Liu Zong Yuan, was not present. Su Yi guessed that he was probably accompanying the experts from Sacred Mountain. Quietly waiting, Su Yi paid no attention to the eyes that fell on him. As time moved on, there were more and more spectators. Sounds of various kinds came from the sea of people which looked like black ants packed together and resonated loudly in the venue. Su Yi was slightly surprised. Sacred Mountain had only come forth to choose a few disciples and such a huge commotion was created. This sight was enough to prove the position of Sacred Mountain in the hearts of the masses. Under the influence of the atmosphere, Su Yi became slightly heated up for action. Since he had already come to this other world, although he does not hope for everything under the heavens, at the very least, he must make his name in this world! Suddenly, there was a movement on the platform. The upper ranks of various families stood up. Su Yi took a look and saw that there were quite a few figures currently strolling towards them. From those few people who were stepping onto the platform, Su Yi’s eyes caught a familiar person. He was around 40 years old and his face still had traces of the handsome contours during his prime. He was the City Master Liu Zong Yuan and the father of that little girl Liu Ruoxi. And in the center of the crowd, there was an old person who looked around 50 years old. On the shoulders of his long robe was an embroidered flower-like patterns which seemed to represent his identity or position. His long face had a smile and his eyes shined. Behind the old man were several large men around 30 years old and there were still quite a few young men and ladies around 16-18 years old. These young people all had fresh and bright clothes. Their temperaments were nothing like that of the average person. Standing in the crowd, they stood out very easily. Seeing the old man walking towards them, the Head of the Houses and the High Elders already started greeting him politely and respectfully from a distance away. The old man walked along the platform to the seat at the very first row, his face constantly smiling. With the heartful leading of Liu Zong Yuan and He Yi Kuan, he was also not all that modest and sat down at the seat in the center. On the contrary, it was the youths following him who did not even glance at the people from the other large families who were of the same generation as them, their eyes showing a sense of pride. Su Yi’s eyes were constantly observing the Dharma Protector whose name seemed to be Wang Quan De. People say that anyone who came from Sacred Mountain was an expert whose name alone could cause a commotion anywhere. This Dharma Protector must no doubt be stronger. When he walked past him just now, Su Yi involuntarily trembled very slightly. Maybe this was what they call an aura’s pressure. Following the arrival of the experts from Sacred Mountain, the ring of a bell sounded throughout the venue. The originally noisy and lively plaza immediately became silent. As the bell rang, City Master Liu Zong Yuan slowly stood up. His eyes, maybe purposefully, or maybe not, swept across Su Yi and then, he looked at the dense mass of humans below the platform. The dense crowd in the four sides of the plaza, as Liu Zong Yuan stood up, raised their heads. A gaze filled with respect fell upon him one after another. Some even shouted out loud. One could easily see Liu Zong Yuan’s position in the city. “Everyone, today is the day in which experts from Sacred Mountain come forth to choose disciples. This is a glorious event for the City of Man! 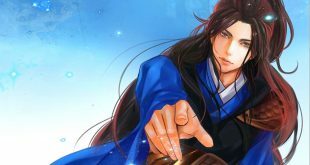 I thank the people of Sacred Mountain for their blessing!” Liu Zong Yuan opened his mouth, his voice filled with Yuan Qi was enough for everyone to hear him clearly. Hearing these words from Liu Zong Yuan, Dharma Protector Wang smiled. The City of Man was in such a desolate place, in between there was even that land of chaos. All this while, Sacred Mountain never considered this kind of place to choose disciples. But it was because of how outstanding Liu Ruoxi was at Sacred Mountain did they make an exception and come to choose disciples and he oversaw the matter of choosing disciples this time. Under the platform, as soon as the City Master finished his words, cheers and shouts resounded and shook the plaza, bursting through the skies. Enthusiasm and liveliness hit its peak. Liu Zong Yuan turned his head and said to the young men and ladies of the large families. The High Elders of the various families reminded the younger generations, fearing that they may be affected by their nervousness. But in reality, the ones who were the most nervous right now were actually these High Elders of the families. One by one the youths walked out. Though they seem calm, deep inside they were nervous. Then, the clothes of these youths shook slightly. There was a movement of Yuan Qi as they shot off into the sky from the platform. There were various kinds of figures in the air. Some elegant, some graceful, and some sharp. Amidst the shouts of praise from the surroundings, they all landed in the middle of the plaza. Even Su Wei managed to land smoothly on the ground. Even though Su Wei was heavily injured yesterday, but he still had the spot to take the test. This was just a test to check for your talent and not a battle. Hence being heavily injured did not have too much of an effect. Many young men and ladies were love-struck. All of them were at the age where one started to know love. Those who could step onto the stage were the most famous youths of the city. Each one of them had many chasers. Hearing the cheers of the surroundings, the young men and ladies which came from Sacred Mountain ignored them totally. They did not even bother to hide the looks of disdain in their eyes. And now, only Su Yi was still on the platform, seeing the graceful and elegant figures of the youths, he was speechless. Even though he was already in the Yuan Soul Realm, but Su Yi felt so awkward that he had never learned any martial arts. Other than his cultivation level reaching the Yuan Soul Realm, Su Yi did not know anything else. The 3 years before were also mostly spent on strengthening his body. Su Yi slightly grinned, and under the eyes of the various big families, he walked to the edge of the platform and looked down in a probing manner from the platform which was around 20 meters in height and finally he jumped down. Seeing Su Yi’s action, quite a few gazes slightly shook. Aid Su Yi really defeat Su Wei yesterday? Seeing how he is now, it doesn’t seem like that’s the case.